Perfect for use as a ground cloth under an approved firepan. Measuring 60" x 72" it provides a generous zone of protection around even the large firepans used by recreationists such as river runners. 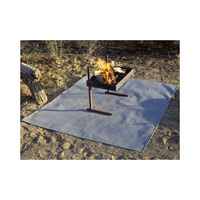 Firepan Ground Cloths use Fire-Sil™, a composite heat resistant fabric. Fire-Sil™ will withstand glowing embers that fall from the firepan, but embers and burning wood should be put back into the firepan as soon as possible. Fires should not be built directly on this product, as prolonged exposure to live flames will degrade the fabric and shorten its lifetime (In an emergency, a small, short duration fire could be built on 3-4 inches of sand mounded on top of the ground cloth.) Used as intended, a Firepan Ground Cloth will give years of use, easing the chore of cleaning up around a firepan.